Burbank, Calif., April 4, 2005- Set in the charming town of Stars Hollow, Connecticut, Gilmore Girls follows the captivating lives of Lorelai and Rory Gilmore, a mother/daughter pair who have a relationship most people only dream of. On May 3, 2005, fans will have the opportunity to relive the rapid-fire dialogue and poignant suds-free storylines with Gilmore Girls: The Complete Third Season on DVD from Warner Home Video. The third season was a year marked by change and difficult decisions including Rory's graduation from Chilton and anticipation for college, two boyfriends fighting over Rory's love and the potential reunion between Max and Lorelai. This collectible six-disc DVD set, which contains all 22 episodes from the third season, is priced to own at $59.98 SRP. People often mistake headstrong single mom Lorelai (Lauren Graham) and her equally determined daughter Rory (Alexis Bledel) for sisters. The two share beautiful blue eyes, the same addiction for coffee, and a tendency to fall into the wrong relationships. The series follows the two women as they interact with the eclectic mix of everyday folks and loveable lunatics of the supporting cast. Gilmore Girls is a humorous heartfelt series that entertains both young and old audiences alike with its original blend of traditional family values with hip, contemporary attitude. "With its witty banter and unparalleled relationships, Gilmore Girls continues to charm audiences from every generation," said Christine Martinez, WHV Vice President, Non-theatrical Franchise Marketing. 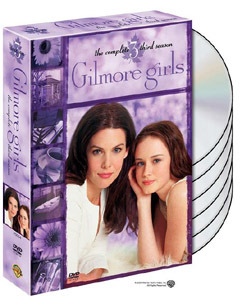 "Gilmore Girls: The Complete Third Season DVD is the perfect gift this Mother's Day for the women in all of our lives." All Grown Up - a documentary with the cast about their childhood experiences. Who Wants to Fall in Love - a montage of the best "love moments" from Season Three. Since its network debut, Gilmore Girls has averaged 4.5 million viewers overall and is The WB's #1 program in its timeslot among females 12-24, a key demographic for The WB. Gilmore Girls is the first series to make it to air supported by the Family Friendly Forum's Script Development Fund. An initiative between some of the nation's top advertisers and The WB, the program is intended to offer a greater array of compelling family programming on network television. The strong, loving mother-daughter relationship portrayed in Gilmore Girls reflects the growing reality of this new type of American family. With operations in 89 international territories Warner Home Video, a Warner Bros. Entertainment Company, commands the largest distribution infrastructure in the global video marketplace. Warner Home Video's film library is the largest of any studio, offering top quality new and vintage titles from the repertoires of Warner Bros. Pictures, Turner Entertainment, Castle Rock Entertainment, HBO Home Video and New Line Home Entertainment. After returning from a summer internship in Washington, D.C., where she mingled with members of the U.S. Congress, including Senator Barbara Boxer, preparatory school student Rory Gilmore (ALEXIS BLEDEL) faces a dilemma with her classmates Dean (JARED PADALECKI) and Jess Mariano (MILO VENTIMIGLIA). Lorelai Gilmore (LAUREN GRAHAM) is overjoyed to have her daughter home, but upon learning that the girlfriend of Rory's father is having a baby, Lorelai questions her own future. Ignoring Lorelai's pleas to stay out of her love life, Emily tries to reunite Rory's father, Christopher (recurring guest star David Sutcliffe), with Lorelai and Rory. This results in an ugly confrontation between Rory and Christopher. Meanwhile, Lorelai rebuffs the romantic advances of the town geek, Kirk, and Rory learns that Jess is angry that she neglected him during the summer. When an application to attend Harvard University arrives, Rory and Lorelai arrange a dinner at an alumnus' house to get advice. Meanwhile, Lane becomes enamored with a boy who answers her advertisement for rock band members. And local resident Taylor Doose (recurring guest star MICHAEL WINTERS) convinces Luke to open an old-fashioned soda fountain next to the diner. The Stars Hollow Parent Teacher Association invites Lorelai and Luke to speak at the high school's career day, but when the students bombard Lorelai with questions about her teenage pregnancy, the PTA moms turn ugly. After discovering that her mother, Mrs. Kim (recurring guest star EMILY KURODA), wants her to go to a conservative religious college, Lane asserts her independence by dying her hair purple--with Rory's help. Lorelai pursues an attractive man, Peyton Sanders (JON HAMM), whom she met at an auction organized by her mother, Emily. However, when the first date is a disaster, Lorelai tries to cancel the second date, and Emily and Richard insist that she is damaging their social standing. Meanwhile, Rory enlists Jess' help when she can't turn off a neighbor's sprinkler system. When Rory is invited to a celebration for her father's pregnant girlfriend, Sherry (recurring guest star MÄDCHEN AMICK), Lorelai is forced to attend as well, and she inadvertently learns more about Christopher's life than she wanted to know. Meanwhile, after Luke interrogates Jess about where he got the money to buy a used car, he discovers that Jess has a surprising second job. 7.) THEY SHOOT GILMORES, DON'T THEY? Determined to win the annual Stars Hollow 24-hour dance marathon, Lorelai forces Rory to be her partner. While everyone in town dances around them, Rory and Jess can't stop arguing, a fact that Dean definitely notices. Lorelai and Rory join Richard and Emily on a trip to visit Yale University, but Richard causes trouble with the news that he has arranged an interview for Rory with the dean of admissions. Meanwhile, Luke tells Jess how he feels about Jess' relationship with Rory. Lorelai and Rory enjoy the bounty of Thanksgiving four times in a row when, on the way to a formal dinner party with Richard and Emily, they stop for celebrations with Lane, Sookie and Luke. Lorelai is shocked to learn that Rory has applied to Yale University. Meanwhile, Dean and Jess almost get into a fistfight over Rory. Lorelai is forced to miss the Stars Hollow Winter Carnival due to the unexpected arrival of Richard's haughty mother, the original Lorelai, otherwise known as Gran (recurring guest star MARION ROSS - "Happy Days"). Gran insists on having dinner with Richard and Emily at the inn and makes a surprise announcement. Meanwhile, Jess refuses to accompany Rory to the carnival--until he finds out that she might go with Dean. Rory is tricked by her manipulative classmate Francie (recurring guest star EMILY BERGL), who convinces Paris that Rory has been plotting against her. Meanwhile, when Emily is sued by a former maid, Lorelai worries that if she gives a deposition in the case, it will cause more problems with her mother. Also, Lorelai meets an interesting man, Alex Lesman (BILLY BURKE), at a business seminar. After surprising herself by agreeing to go on a fishing date with her new beau, Alex (BILLY BURKE), Lorelai asks Luke for a lesson in fishing techniques. Meanwhile, the political battle between Rory and Paris escalates when Paris tries to have Rory impeached. Lane plots to go to the prom with a guitarist, Dave (recurring guest star ADAM BRODY). And Luke asks an attorney, Nicole (recurring guest star TRICIA O'KELLEY), on a date. When Christopher's pregnant girlfriend, Sherry begins labor and asks Rory to stay with her at the hospital, Lorelai reminisces about the day Rory was born. In flashbacks, 16-year-old Lorelai (CHELSEA BRUMMET) learns she is pregnant, decides not to marry young Christopher (PHILLIP GLENN VAN DYKE) and leaves home with her new baby. Lorelai goes away with her new boyfriend, Alex for a weekend in New York, but she worries about leaving Rory and Jess together. Meanwhile, when Jess goes with Rory to dinner at Emily's house and refuses to explain his injured eye, Rory accuses him of fighting with Dean. Tired of waiting for Jess to call and make plans for the weekend, Rory accompanies Lane to a hockey game, where she encounters Dean and his new girlfriend, Lindsay (ARIELLE KEBBEL). Meanwhile, Lorelai confronts Jess about his poor treatment of Rory. And when Gran comes to visit for a few days, Emily is shocked to find her kissing a man. While nervously waiting for their college acceptance letters to arrive, Rory and Paris compete to give a speech at Chilton Academy's bicentennial celebration. Meanwhile, when Lorelai encounters her former fiancé, Max Medina (recurring guest star SCOTT COHEN), and they share a passionate kiss, she wonders if ending the engagement was the right decision. Also, Sookie's strange behavior has a surprising explanation. When a meeting of the Edgar Allan Poe Society at the Independence Inn is interrupted by a minor fire, Lorelai must find rooms for the guests at various homes around town. Forced to relinquish her bedroom in her own house, Lorelai spends the night at Luke's place. Meanwhile, trying to decide amongst Harvard, Yale and Princeton, Lorelai and Rory make an extensive list of positives and negatives for each college. And Luke worries that Jess may not be attending school when he learns that Jess has been working a surprising number of hours at a local drugstore. While Lorelai deals with the rebuilding of the fire-damaged inn, Rory schemes to give her mom a great birthday party, complete with a gigantic pizza. After Richard surprises Lorelai with a large check that resulted from an investment he made when she was born, she uses part of the money to repay her parents for Rory's education, a gesture which does not please Emily. Meanwhile, Luke confirms that his suspicions are correct: Jess has been skipping school to work extra shifts at the drugstore. With graduation approaching, Rory happily anticipates attending the Stars Hollow High School prom with Jess--but he gets some surprising news from Principal Merten (LAWRENCE HILTON-JACOBS - "Welcome Back, Kotter"). After Lane's rock band debuts at a big party, the evening ends badly when the longstanding animosity between Jess and Dean finally results in a fistfight. Meanwhile, Lorelai reluctantly serves on the parents' committee for the Chilton graduation party, uncomfortably reuniting her with her former boyfriend, Max Medina (recurring guest star SCOTT COHEN). After the brawl between Jess and Dean, Lane is in a lot of trouble with her conservative mother, and Luke is furious at Jess. But ironically, Lorelai is proud of Rory for causing such passion in two guys. Later, a mysterious coffee shop patron observes Jess at work and accidentally leaves his wallet behind. Upon finding it, Luke is amazed to discover that the man is Jess' estranged father, Jimmy Mariano (recurring guest star ROB ESTES - "Melrose Place," "Providence"), from California. Jimmy's arrival causes Jess to ponder a major decision. Meanwhile, Lorelai's relationship with her mother gets worse. Dean amazes Rory with a life-altering announcement. And Lorelai and Sookie guiltily try to capitalize on the death of a beloved bakery owner whose building they desperately want to convert into their own inn. Jess leaves Stars Hollow and travels across the country to Venice, California, where his father, Jimmy lives. The reunion and the important decisions it engenders causes tension with Jimmy's live-in girlfriend, Sasha (SHERILYN FENN - "Twin Peaks," "Boxing Helena"). Meanwhile, although she has an almost impossible amount of school-related work to complete before graduation, Rory agrees to help her grandmother choose an outfit for the ceremony--resulting in another conflict with Lorelai. Also, Lorelai agonizes over paying for Rory's Yale education. In the season finale, Rory and Lorelai happily prepare for Rory's graduation from Chilton. But major developments involving the Independence Inn threaten to dampen the festivities. Rory secretly approaches Emily and Richard for help. Meanwhile, Rory and Dean share a bittersweet moment as he prepares for a big life change. Rory's beautiful valedictorian speech causes many tears. Rory and Lorelai are excited about their summertime European trip. And Luke has a surprising dream about Lorelai on the night before a romantic cruise with his girlfriend. Recurring guest star musician GRANT LEE PHILLIPS appears as the Town Troubadour.